My wife uses her iphone running ios 10+ and fills up her storage quicker than most. While I typically use an android based smartphone and know how effortless it is to manage the photos on my device, I realized how cumbersome it was to do the same thing on an IOS device! How to quickly copy and delete all photos on your iphone, ipad, or other IOS device. 3. Plug in your IOS device. iFunbox may give you an error like below. If this is the case, click YES, and then go to your ios device and accept the trust the device message. If iFunbox gives you this message, click OK and click the TRUST button on your IOS device. 4. At the top of iFunbox youll then see that its connecting to your IOS device. 5. After iFunbox has connected, click the File Browser tab at the Top – far left side. 6. iFunbox will display the contents of your IOS device on the lower left window pane. 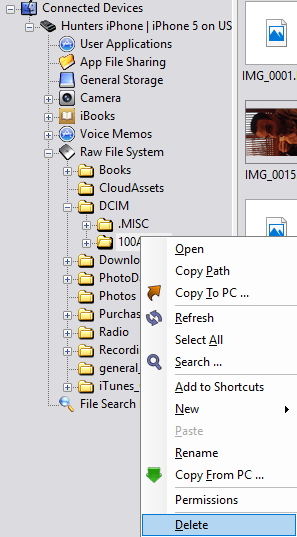 Expand the ‘Raw file system’ and expand the ‘DCIM’ folder. Right click the 10xAPPLE folders and select ‘Copy to PC’. Select the desired location on your computer for the photos to be saved and click OK. These 10xAPPLE folders contain all of your photos. Do this for all the remaining 10xAPPLE folders. 7. After you are done saving the photos to your computer (double check they are all there! ), you are ready to delete the photos located ON your IOS device. Right click on each 100xAPPLE folder and click on the ‘Delete’ option Do this for all the 10xAPPLE folders to remove them from your IOS device. 9. After you’re done, just click the IOS device tab at the top right, and click ‘Device Safe Removal’. You can then unplug your iphone or ipad from the computer. Some things to note after deleting photos from your iphone, ipad, or other ios device. After you’ve completed the steps above, you should reboot your IOS device and open the Photos app. You may see a screen saying that its updating, or even that it opens and immediately closes again. This is because the photos app is rebuilding the databases and will take a few minutes. You will probably also want to delete the icloud photos backup as well after you do this. The reason being is that now that you have a local backup of your photos, you might as well free up the icloud storage to be used for the new photos you will be taking. In case you lose your phone, you’ll still have your new photos saved in your icloud photo storage. Head over to icloud.com and login, then select the photos icon. Manage and delete all the photos from there! This entry was posted in Computers and tagged copy photos to computer, delete all photos from ipad, delete all photos from iphone, ifunbox, ios, ipad, iphone, photos on December 16, 2016 by Blog Master.